Rajasthan, the home of arts and artisans will not leave you empty-handed and gift you many artistic outputs whenever you visit the place. Each village and town in Rajasthan is rich by its ancient heritage, vibrant lifestyle and beautiful art forms. Since India is rich and abundant in nature, one can easily notice the influence of nature in all its art forms. Among them, Bagru and Sanganer hand block printed textiles are no exception. 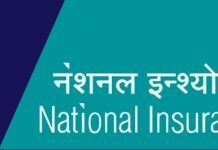 The desert state of India put forward a range of handicraft products such as blue pottery, terracotta pottery, paintings, handmade cotton bedsheets for the customers to take benefits of. They have even made a remarkable place in the international market and are being largely appreciated there. 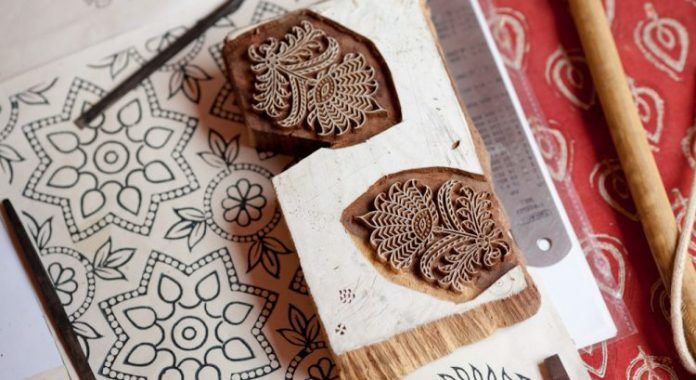 A big thanks to expert craftsmen of the small villages of Rajasthan, who have kept the three- centuries old tradition of block printing alive in India. Because of them, we get to witness the ancient art form that is in perfect symphony with nature. 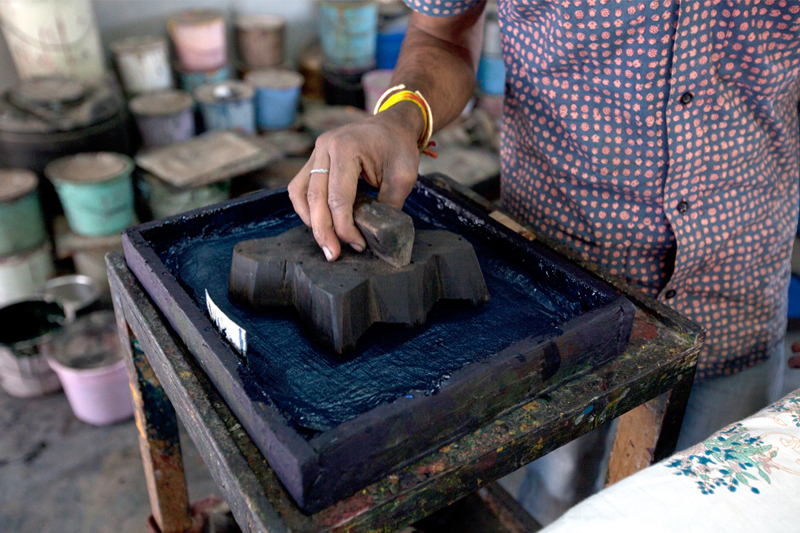 Sanganer, a small village near Jaipur is one of the major centers of fine block cutting and printing in India. Sanganeri prints are almost 500 years old and they have gained the highest popularity in 16th and 17th century. Thanks to the constant wars between Mughals and Marathas, many craftsmen migrated from Gujarat to Rajasthan and by the end of 18th century, a big textile industry was developed in Sanganer.It is estimated that today more than 25% of the population is directly or indirectly dependent upon Sanganeri print industries for their livelihood. Low toned colors and sober design patterns mostly poppy, roses and lotus usually against a white background are the significant characteristics of the fabrics that are printed in Sanganer. The creative fine designs of Sanganer are very much different from the bold patterns of Bagru. Fine lines, intricate detailing and floral prints are the specialty of Sanganeri style. Natural dyes such as vegetable colours are used for the dying purpose of Sanganeri printed cloth. Bold patterns and colors are popular but Sanganeri prints are known for its Calico printed bed sheets, quilts, saris and shirts. The sanganeri art form of block printing includes many design patterns. While big flowers such as sunflower, roses, and narcissus are common motifs in Sanganeri prints, various gods, fruits and folk patterns are also very popular. Bagru, a small village situated at 32 km east of Jaipur city is known for its bold patterns all over the world. The traditional technique of Bagru hand block printing is followed by Chhipa community of this remote place. Dark-hued motifs are imposed on lighter backgrounds with wooden blocks and craft a pattern that you will not find anywhere else. The Indian cotton bed sheets which are exported all over the world are mainly originated at Bagru. Red and Black are considered as the chief colors for Bagru printing. The motifs of Bagru printing has changed over the time. Initially, these motifs are created using natural objects like neem leaves, rose petals, chilli and coriander spring. 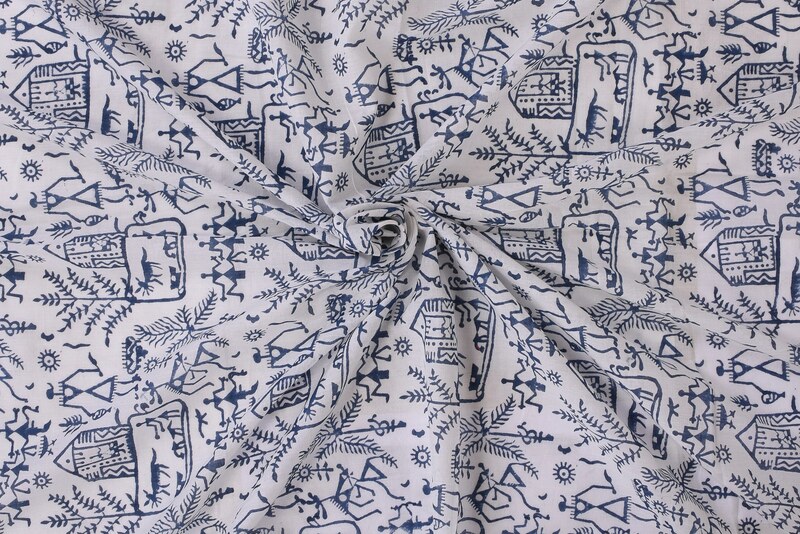 The traditional Bagru prints are used for making kurtas, quilts, printed shirts and bed sheets. After influenced by Persian art forms, the design patterns became more geometrical such as many fabrics are seen with a central round with some floral or leafy motifs placed around it. 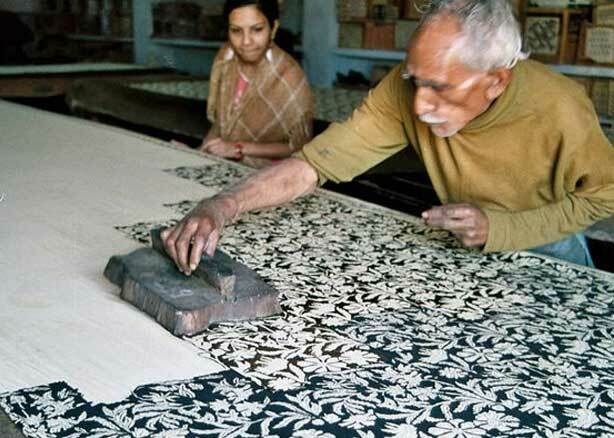 The ancient craft of Bagru handblock prints has been handed down generations but with the major revival in the textile industries and printing manners. To acknowledge the ancient traditions of India mainly the printing, natural dyes, and hand embroidery, a visit to Bagru and Sanganer is enough where the heritage art forms are nurtured by the hard work and love of the local population. Today India is a fashion vanguard in the international market. Buyers from all around the world have been greatly attracted towards the Indian traditional hand printed textiles. The export market of Indian textiles is so consistent that keep craftsman busy whole year. So when the next time you visit Rajasthan, make sure names of Bagru and Sanganer are in your itinerary to appreciate the centuries old tradition of hand block printing process. Author Bio: Shreya is a blogger and travel freak. She holds a great interest in fashion and spends much of her time in exploring the giant fashion world. She is a food lover and working as a digital marketing manager at Divinity Mart. Next articleDid You Know Rajasthan Has Highest Number Of Vegetarians?